I definitely have Fall Fever. I worked on my Fall Mantel this past weekend, and now I can’t stop. The only problem is…there are NO PUMPKINS TO BE FOUND! Don’t they know that I need pumpkins right now? Don’t these pumpkin growin’ fools know that there is a Primp Your Pumpkin party happening next week? Since they don’t, I have been making my own pumpkins. 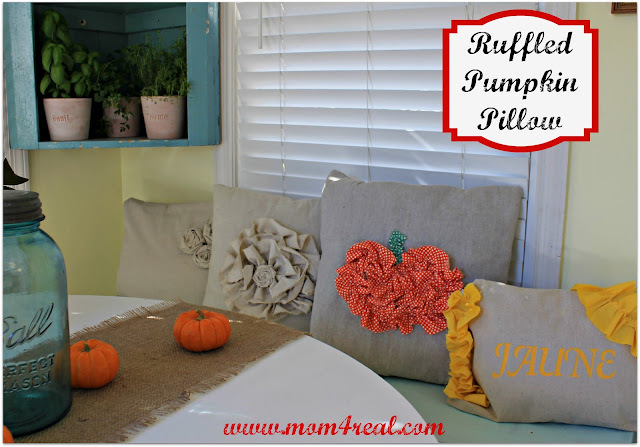 I did find some mini pumpkins at the grocery store, so I used them to add a little Fall accent to my breakfast nook, then I thought…how about a pumpkin pillow? So, I sewed a long ruffle in Riley Blake rouge dots, and hot glued it to the front of one of my Dropcloth Pillows in the shape of a pumpkin. I love it nestled in with the others. 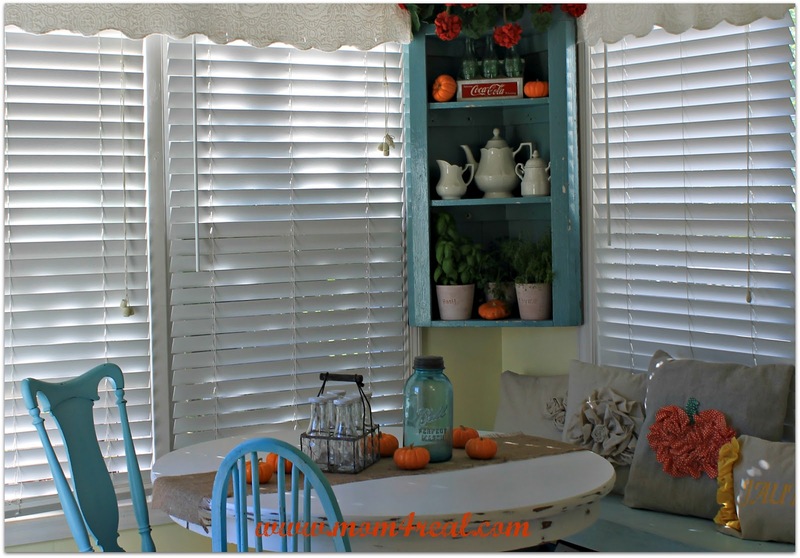 Now my Newish Breakfast Nook feels nice and Fallish ;) Are you decorating for Fall yet? We need to have a serious talk. What did I tell you about these “pumpkins” Jess… it’s not ok. All kidding aside- These pillows kick Jack-o-laterns BOOTIE!! So cute! You and those ruffles girl.. I swear it is your trademark! Way to do it!! I finally found some pumpkins at Kroger yesterday! Love your pillows! I’d love for you to share this at my party, Twirl & Take a Bow at http://www.houseontheway.com. There’s a giveaway too…a monogrammed burlap pillow. These are so cute!! I love pumpkins! wow these are so so cute! love it! Super Super cute!!! LOVE how adorable they are!!! Those are adorable! :) We are overloaded with pumpkins here in MD. I hope you find some soon. These are SO cute! I hope you’ll link up to my Wickedly Creative Halloween Ideas Party (fall ideas too). Cute pillow design…and how fun is your nook?? Your ruffled pumpkins are THE cutest!! And that nook…. ohhh, I’d love to drink my morning coffee there every day. Although who am I kidding- I run around chasing these little boys so much that I reheat mine 20 times before dumping it around noon! I love your description of a morning with kids to get off to school! I have 2 boys, 49 and 47, and a daughter, 39. But I can still remember how much fun ??? ?it was, getting them dressed (appropriately???? ), their lunches made and out the door on time! I miss that time in our lives. I do also have 2 grandchildren, a boy, 22, and girl, 21. They’re all wonderful “kids”. I hope they have fond memories of those times too. I just saw your idea on TT&J. I love these pillows! I would be happy to have you share them and any other ideas you would like to link up at “One Creative Weekend” on OneCreativeMommy.com. The party is open every Fri-Wed. I hope to see you there! That is such an adorable pumpkin pillow! Too Cute! Love the pumpkin pillow!! That’s using your pumpkin!! What fun pillows – all primped out and ready to party! These are so cute!! TFS. All of your pillows are way cute. The pumpkin one is super creative. Hey Just wanted to let you know I featured this on my blog, it’s so cute! OMG!! Those pumpkin pillows are the cutest!! Tutorial please!!!! I love them!! I just found your blog and I’m now following!